Bougainvillea is a member of the Nyctaginaceae Family. It is a large cascading shrub or thorny vine that can grow to 20 feet in height, but is more typically 10-12 feet tall. It has shiny, green, elliptical leaves which grow to 4 inches in length. 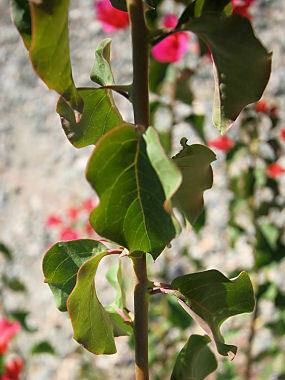 The plant is used in landscaping throughout Phoenix. 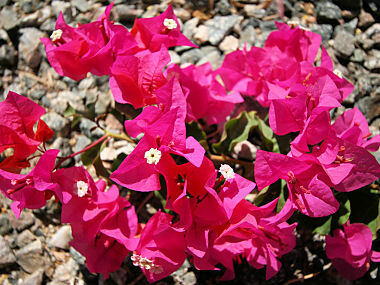 Bougainvillea is not native to Arizona, it originated in the tropical forests and scrublands of Brazil. It is also commonly called "Paper Flower". Bougainvillea blooms once or twice a year and produces bright, reddish-pink petal-like bracts (modified leaves) surrounding the flower. The actual flowers are quite small, tubular and white in color.